Few things are warmer or more comforting than slipping into a pair of fluffy slippers on a chilly day. It gets even better if you crocheted the slippers yourself, or received them from a friend as a gift. Although some crochet slipper patterns can get quite ornate, many use just a few basic stitches and simple shaping techniques. This pattern is for the slippers pictured in the photo above. If you need help downloading the printable instructions, check out these helpful tips. To count stitches feel between them with your fingers. Use a marker for beginning of rounds. 2sctog: draw up a loop in next 2 stitches. Yo and pull through all loops. Decrease is made. Chain 3, sl st in 1st ch to form ring. Now try on your foot for fit up to start of heel. Rows 13-17: Ch 1, 12 sc. TURN. Row 18: Ch 1, sc in each of next 4 sc. (2sctog) twice. Sc in each of next 4 sc. Row 19: Ch 1, sc in each of next 3 sc. (2sctog) twice. Sc in each of next 3 sc. Finishing: Ch 1, sc around top opening of slipper, sl st join. Sew back seam closed with sl st. Bind off and weave in ends with tapestry needle. If you can crochet in the round, these fluffy bunny slippers (sized for adults) are easy to work. These easy mother-daughter slippers are sized for both adult women and girls. You must create an account to download the free pattern. These plush, ribbed slippers are sized to fit a woman's foot. "Plush in a Rush" slippers work up fast with bulky-weight yarn. Although these patterns require knowledge of more stitches and shaping techniques, they're still built on the same basic techniques you'd use for an easy slipper pattern. Sueded yarn makes these intermediate-level lace-up, loafer-style slippers feel fluffier than they look. This intermediate pattern for soft, fluffy slippers offers homestyle comfort and they, too, lace up for adjustable sizing. These comfortable, fluff-trimmed flip-flop slippers require foam rubber cushions. The pattern is free, but you must register for an account to download it. Although the yarn is soft, it's popcorn stitching that gives these slippers their soft texture. These intermediate-level "wolf" slippers, sized for adult men and women, form a dense mop of "fur" around each foot. Although you can adapt adult slipper patterns for children's sizing, child-specific patterns eliminate the need for experimentation. Many of them come in kid-friendly colors and designs that make them both functional and fun. Soft, lightweight yarn keeps these easy-intermediate plush bunny slippers from shedding all over your floor. Each of these easy ribbed slippers is topped off with a pompom. Plush it up even more by using a boucle, suede or homespun yarn. For maximum comfort, work these easy and fast unisex, clog-style slippers in a thick, plush yarn. These basic, pink, kid-sized slippers make a nice entry into the world of bunny slippers. These easy cute heifer slippers are stuffed for extra "fluff." For more soft, stuffed slippers, check out these pudgy piggy slippers. 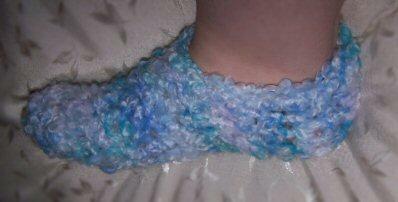 These easy "dust mop" slippers use a loop stitch to give them their fluffy, mop-like texture. One of the best things about hand-crocheting your own slippers is that you're always in charge. A change as simple as substituting one yarn for another or switching crochet hooks can drastically alter the look of the finished project. If you find a lovely pattern that's not plush enough to suit you, add a boucle or eyelash yarn to fluff it up. Are the slippers not sturdy enough? Switch to a smaller hook for tighter stitches, or hold another strand of yarn as you crochet, creating a thicker finished fabric. Once you find a pattern you love hold onto it. Odds are you'll be making those slippers for yourself, and others, for years to come.